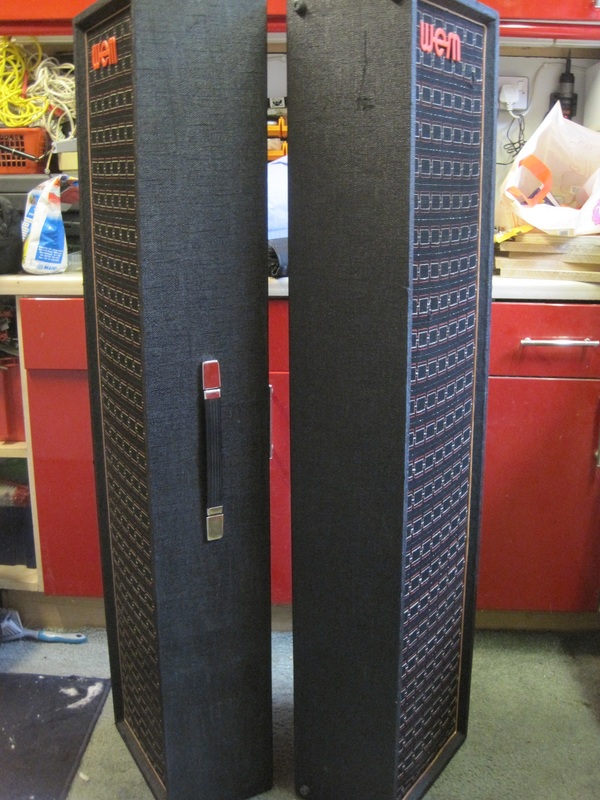 Another recent acquisition (Nov. 2015) is this pair of 6 x 8″ PA cabs. 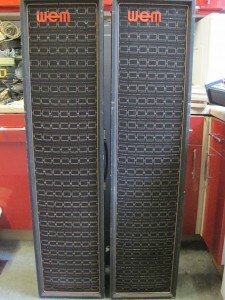 Each cab is fitted with 6 Elac 8″ drivers which are marked as 8RM/211 and 10 ohms. I assume the 8 refers to the size but I can’t find any info on what the rest of the code relates to. 10 ohms seems unusual but they are all marked the same and I’m certain they are all original. 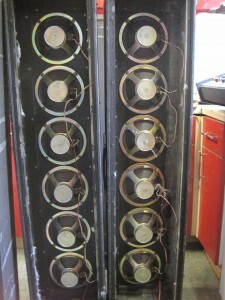 The 6 drivers in each cab are wired in 2 sets of 3. Each set of 3 is wired in series giving 30 ohms and then the 2 sets are wired in parallel giving a total impedance for the cab of 15 ohms. 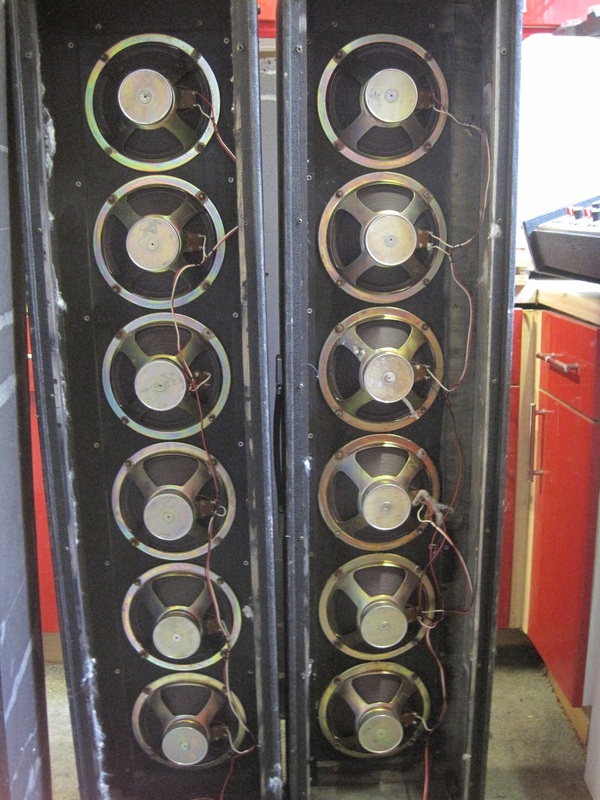 Watkins put an impedance badge on the back of each cab stating they are 12 ohms which they obviously felt was close enough to 15 ohms and the 12 ohms then matched up with the 12 ohm output sockets on amps such as the PA40 and PA100. 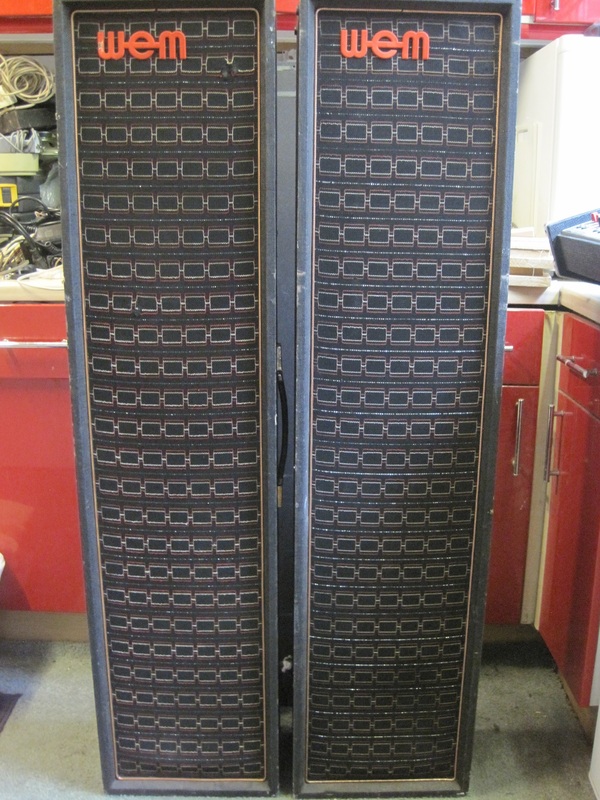 As can be seen from the initial pics, the cabs have various marks and there is also some corrosion around the driver retaining nuts but this is nothing more than I would expect for cabs of this age. 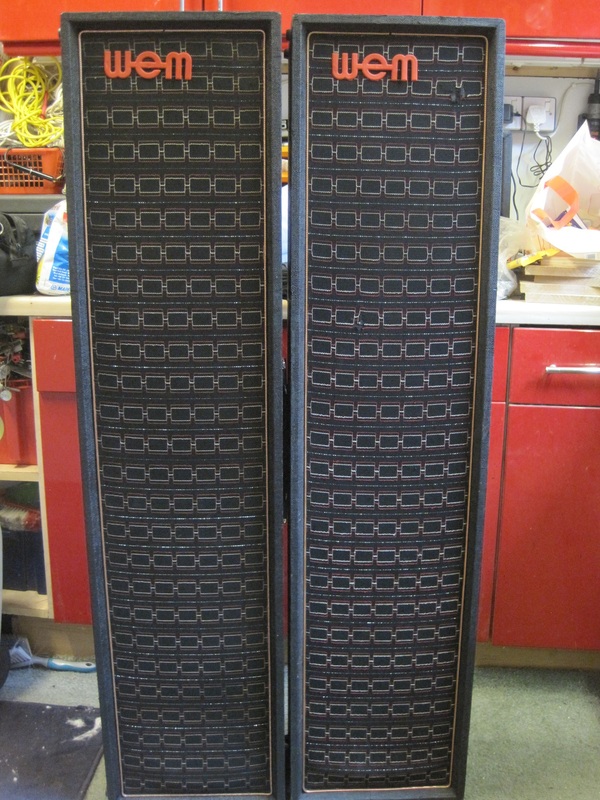 In fact, overall, I would say they are in good condition for their age. 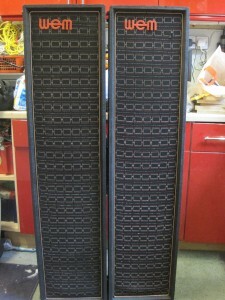 The WEM literature indicates that a pair of these cabs can be used with 40 and 100 watt amps. I would therefore assume the power rating of each of the Elacs is approx. 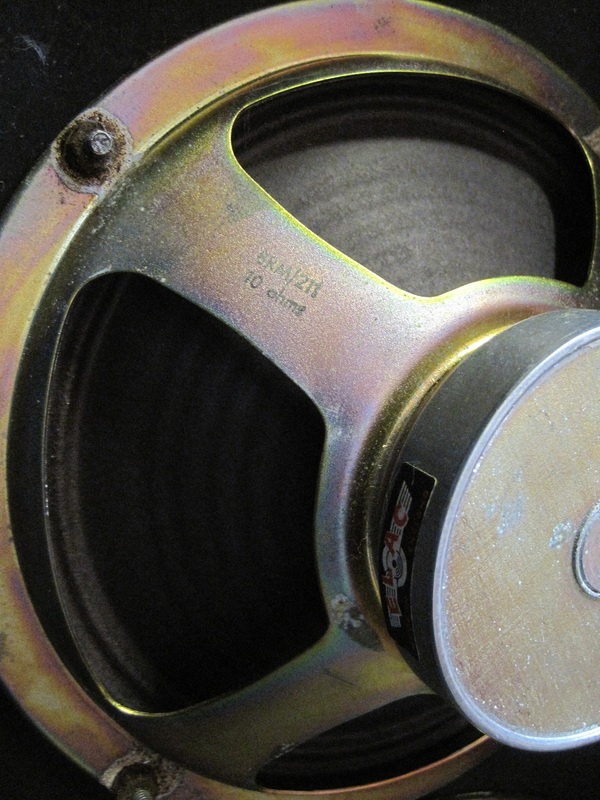 10 watts although there is nothing on the drivers to substantiate that. 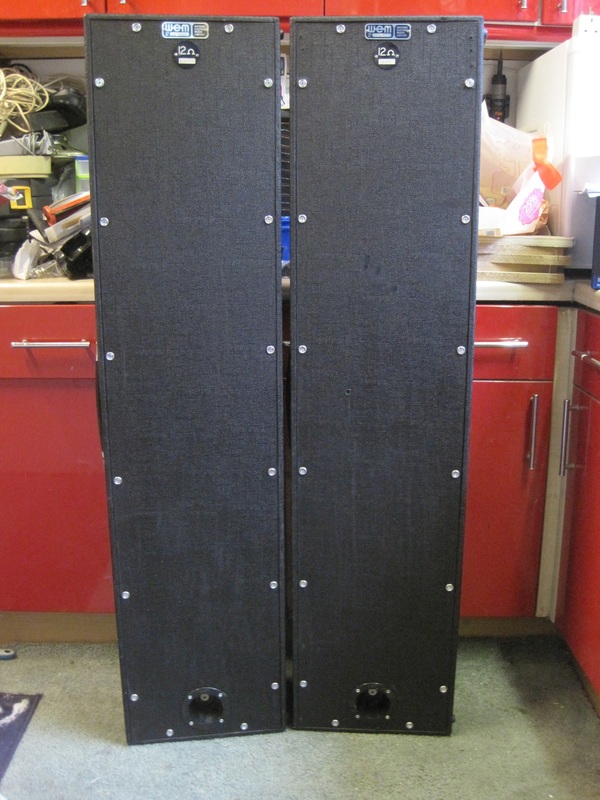 The following 3 pics show the cabs after refurbishment. To be honest, they didn’t need a lot of work. I repainted the logos as some paint was peeling off. I also fitted new feet and handles on the sides. And I also cleaned and polished the tolex.